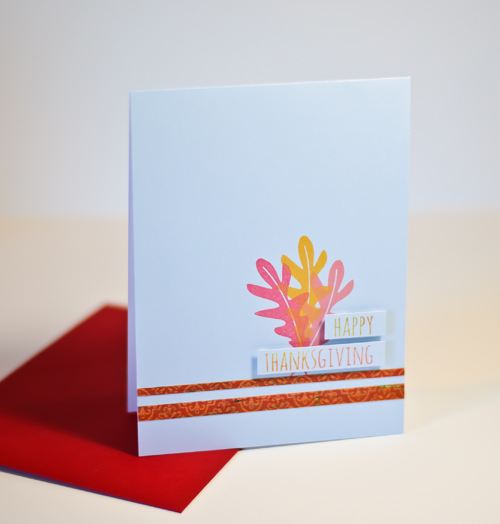 Stamped a leaf from Essentials by Ellen's Autumn Acorns three times onto pale blue cardstock from A Muse Studio. Added a couple of strips of unknown patterned paper that I had colored over with a yellow Copic because the tone must be right, right? Popped up the sentiment from the same set and inked a few times to give it a gradient look. Almost worked. HUSBAND'S COMMENT = I like those leaves. You tell your husband I like those leaves too. Have had my eye on this set for awhile now. It will be mine by the end of the month. You are ROCKIN' this set, Joan! Pretty colors on those leaves. You have the BEST ideas!